I awoke at 5am and set off, leaving my partner sound asleep in the comfort of our air conditioned room. I stepped outside and was immediately hit by the Egyptian heat, I looked up to the sky and to my delight, there was a cloud cover. The sky for 90% of my time in Egypt was mostly cloud free and I hoped for clouds to add interest to the scene. It was already getting quite light so I hurried to location, took out my camera and started exploring different compositions. I found 2 compositions that I wanted to capture so set down my tripod for the first, fine tuned my composition and waited for the sun. I stood eagerly waiting for the suns disc to peek above the horizon as the waves lapped around my ankles. A bird perched up on the rocks next to me, becoming my audience as I stood brandishing my camera remote and smartphone with the stopwatch at the ready. The sun appeared at approximately 5:47am, I could feel the rise in temperature as the suns rays began to beat down on the the Egyptian coastline. I began shooting. Just as the sun positioned itself between some low lying clouds and the band above it, I captured this moment. 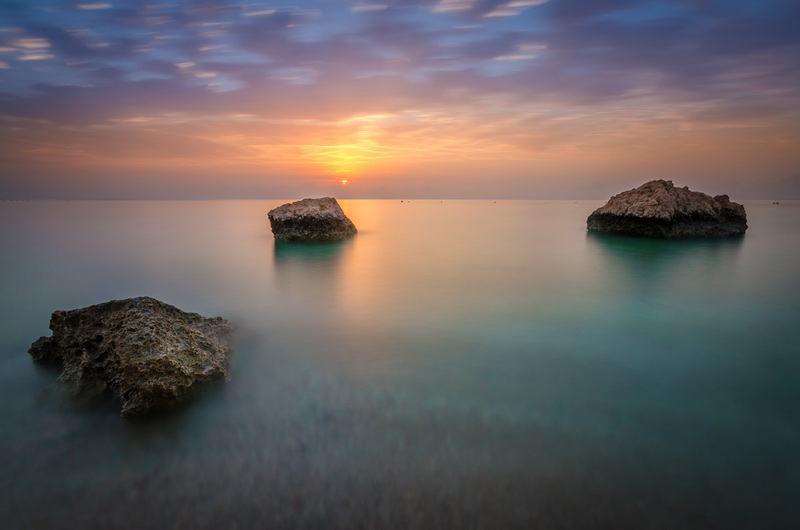 I used a long exposure to blur out all but the details in the rocks letting the beatutiful colours of the Egyptian sea, sky and the rising sun shine through. Older PostAnd We Are Live! robcrawshawphoto.com Launches!